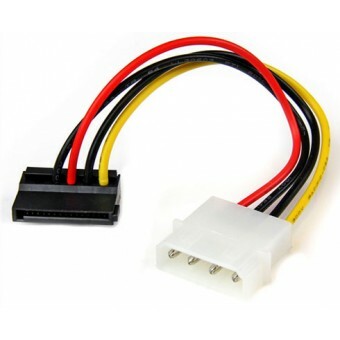 The SATAPOWADPL Molex to 90-degree SATA power adapter features one 4-Pin Molex (LP4) male connector and a left angle, 90-degree SATA power connector (female), which enables you to power a Serial ATA hard drive from a conventional LP4 connection and eliminates the need to upgrade the computer power supply for compatibility with the SATA hard drive. The 90-degree (left angle) SATA power connector makes it easier to connect a SATA drive that's installed in hard to reach areas or tight spaces, avoiding the strain on both the connector and cable. This LP4 to SATA adapter is backed by StarTech's Lifetime Warranty.